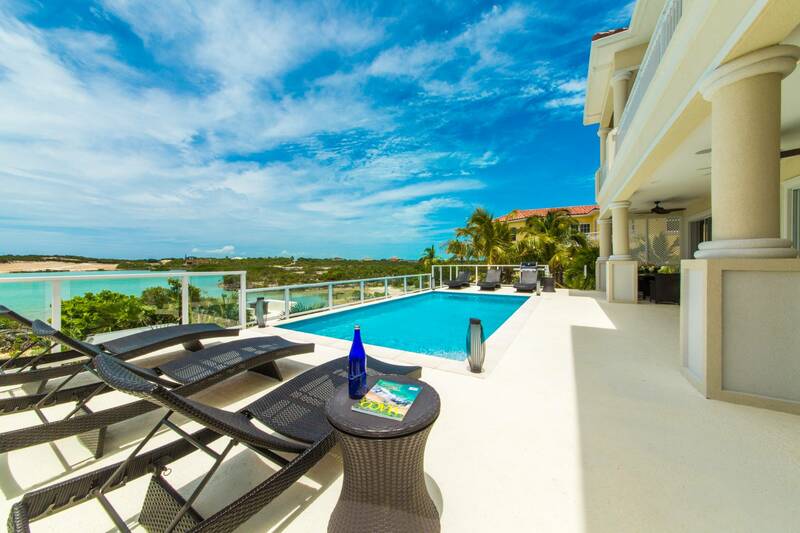 Set in the upscale community of Silly Creek Estates, this luxury villa offers stunning views and a private lagoon-style beach. 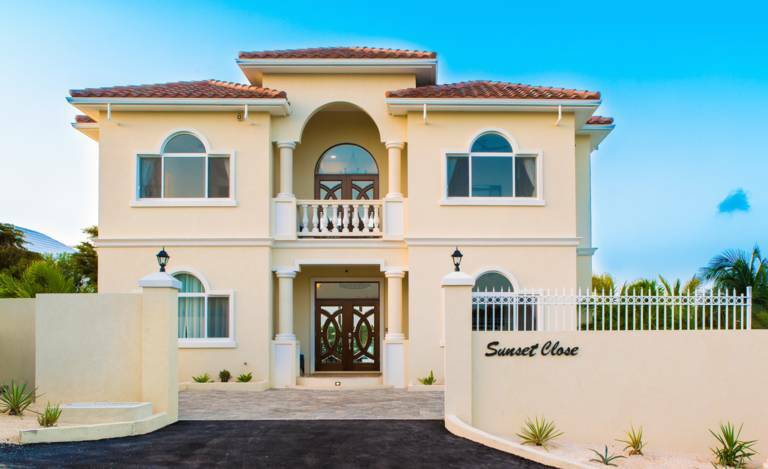 Sunset Close is a newly-built 4-bedroom property featuring a bright white interior with Caribbean accent colors and modern furnishings. 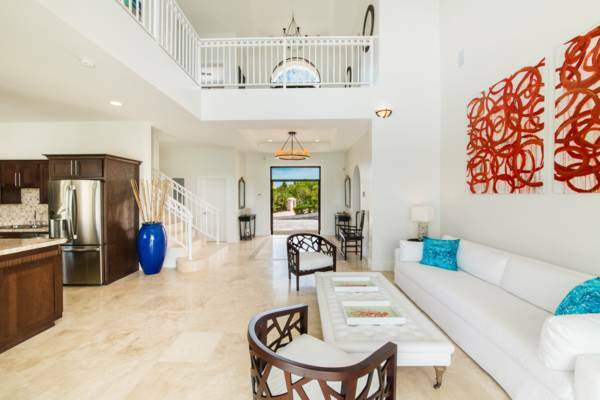 The spacious open-plan living area has sliding glass doors to your pool and the fabulous view. 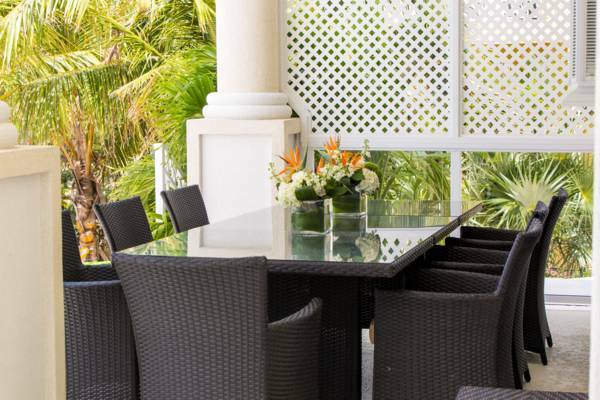 The covered terrace and cushioned seating is the place to be to enjoy the breeze. 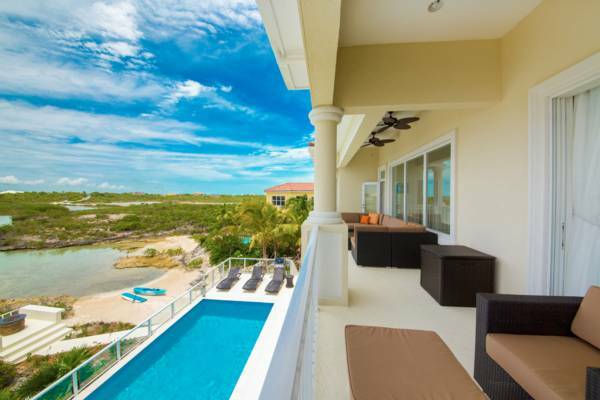 Just off your pool patio is a waterfront lounge deck and small beach with sun recliners. Jump into the villa’s kayak or onto the paddle board and head out to explore. 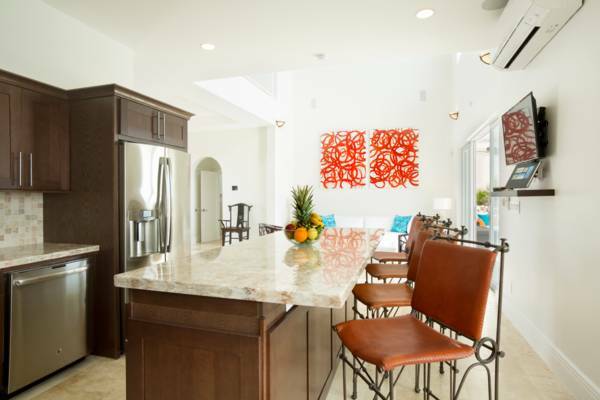 The fully equipped kitchen and breakfast bar were designed with mornings in mind. 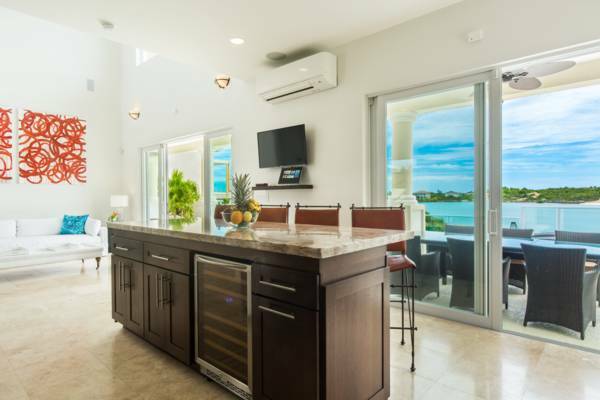 Stay simple with just a coffee and the view, or create something amazing with the range of amenities such as the Nespresso machine, French press coffee maker, blender, juicer, waffle iron, and wine fridge. As evening approaches, turn up the BBQ and cook up an island-inspired seafood meal, relax in the outdoor hot tub, or chit-chat around the fire pit. 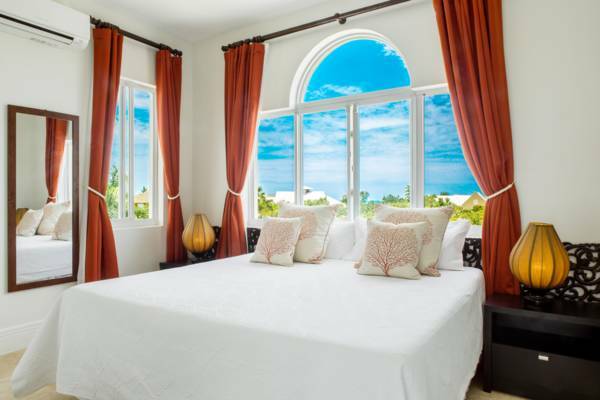 Take in the vibrant Turks and Caicos sunset and then gaze at the stars above. As you’d expect in a luxury home, there’s modern technology to keep you entertained. In the air-conditioned theater is a 60” Smart TV, DVD selection, Wii, and indoor and outdoor Bluetooth speakers. 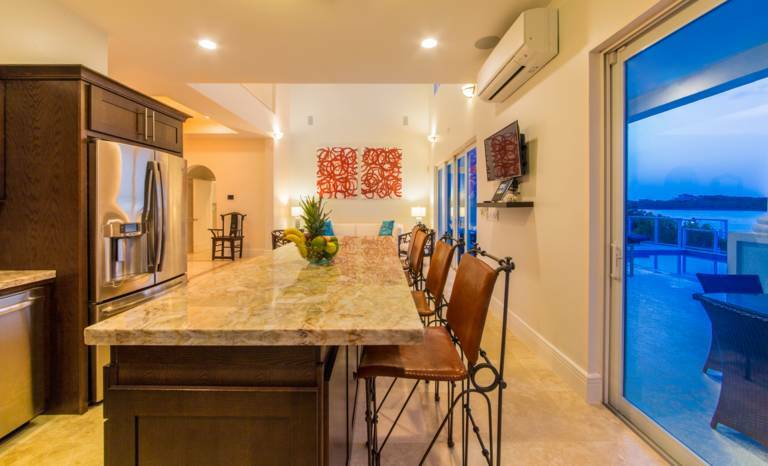 There’s a Smart TV in the living room and bedrooms, cable television, Wi-Fi, and a mobile phone to use for local calls. The two master bedrooms feature walk-in closets and en-suite bathrooms with custom-built vanities, floor-to-ceiling tiled showers, and soaking tubs. 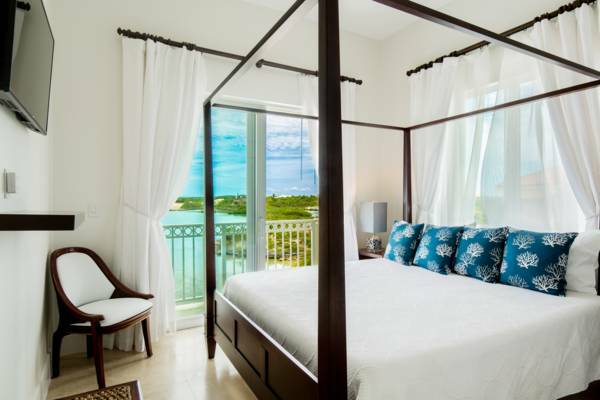 Each bedroom has an eye-catching view through sliding glass doors that lead to either a patio or balcony. Open the doors and feel the trade winds. 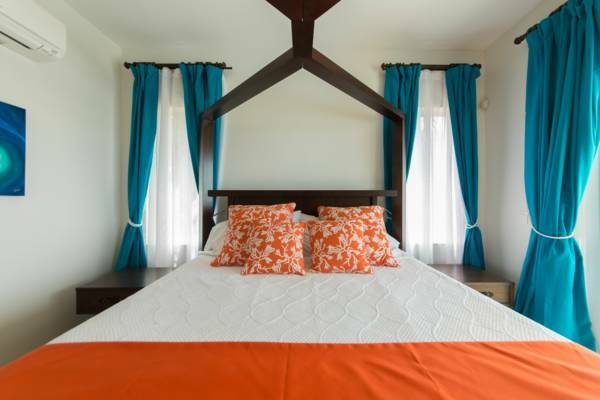 Three bedrooms offer king size beds; the fourth has two extra-long twin beds that can be converted into a king bed on request. 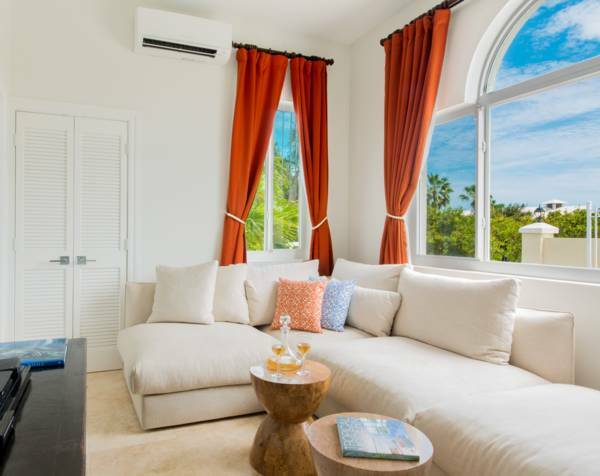 Each room has ceiling fans and air-conditioning. Your villa is next to Chalk Sound National Park with its exceptional blue water and tiny craggy islands. The popular Las Brisas restaurant is perched on the edge of the Sound, and is an ideal place to soak in the view as you lunch or dine. 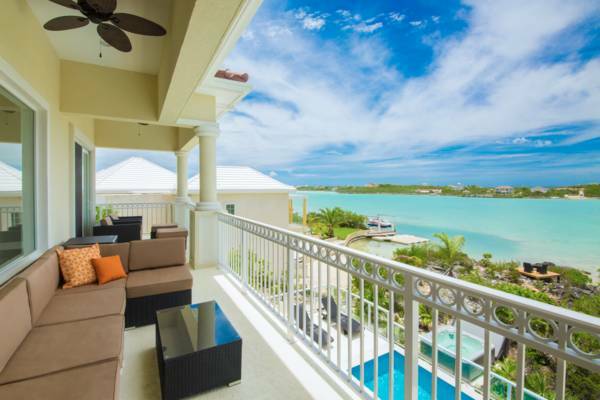 Just minutes from your villa are both Sapodilla and Taylor Bay Beach. The calm and shallow waters are perfect for families. 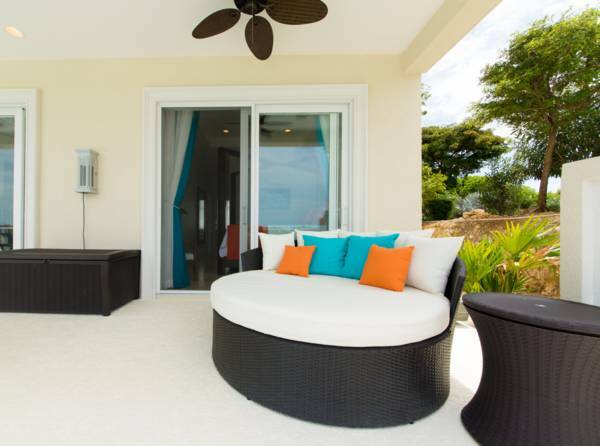 Fill up the villa’s drink cooler, grab the portable beach chairs, and prop your umbrella in the sand. 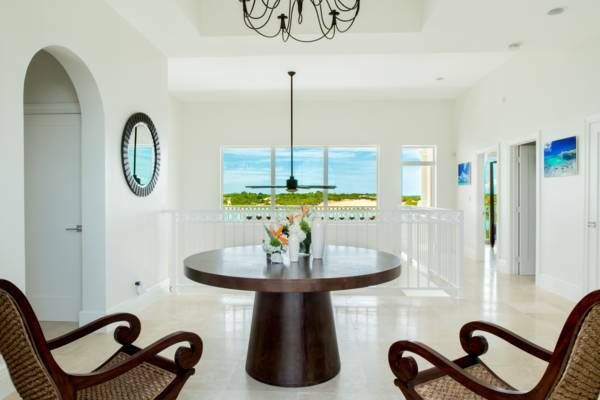 Eventually, you’ll want to leave the peaceful seclusion of your villa to see the sights and sounds of Grace Bay. The world famous beach and the rest of island are nothing more than a short drive away. Master Bedoom (see photo): King bed overlooking the water. Bedroom 2 (see photo): Queen bed. Bedroom 3 (see photo): Queen bed. Bedroom 4 (see photo): Two twin beds. Thank you so much for hosting us on such a short notice. You helped us make lemonade out of lemons. Its a wonderful house and we had a great time. I would also highly recommend Lady K for charters so you can experience all these beautiful islands. All the best! New and very modern villa. … New and very modern villa. Two master suites are wonderful. Had good security system. Kitchen was well stocked. Pool and beach area were wonderful. Great views. Quiet location.